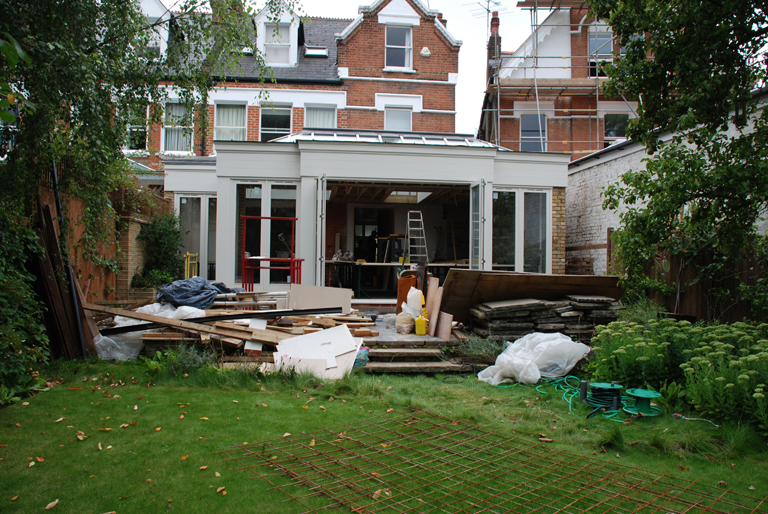 I went back to visit my project in London on Friday where I redesigned the terrace area as part of an extensive house renovation project. It was far too dark to take photographs when I planted the garden back in November so I am very pleased to now be able to share the “after” pictures with you. Essentially, the basic layout of the terrace was to remain unchanged, but there were a few major things to address. The ugly wall on the right hand side of this picture needed to be screened, the inset area at the side of the extension (Left hand side of picture) required some careful consideration and the steps to the lawn needed to be addressed as they just didn’t fit comfortably with the terrace. The existing York stone paving remained in place, but had to be modified so that it would fit the new design. I wanted to create a space that was a discrete area in it’s own right, but that was connected to the formality of the house and the informality of the garden. As you can see it’s quite a transformation, and not only because it’s no longer a building site! 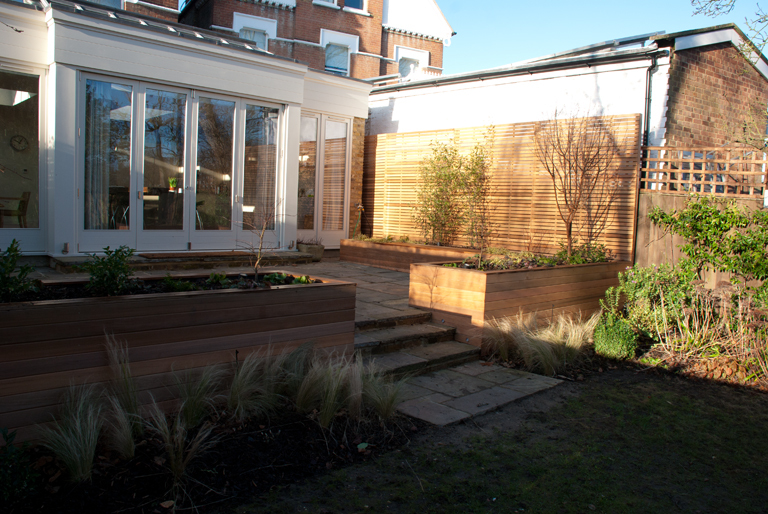 The raised built-in planters provide a barrier from the terrace to the rest of the garden without cutting it off completely. 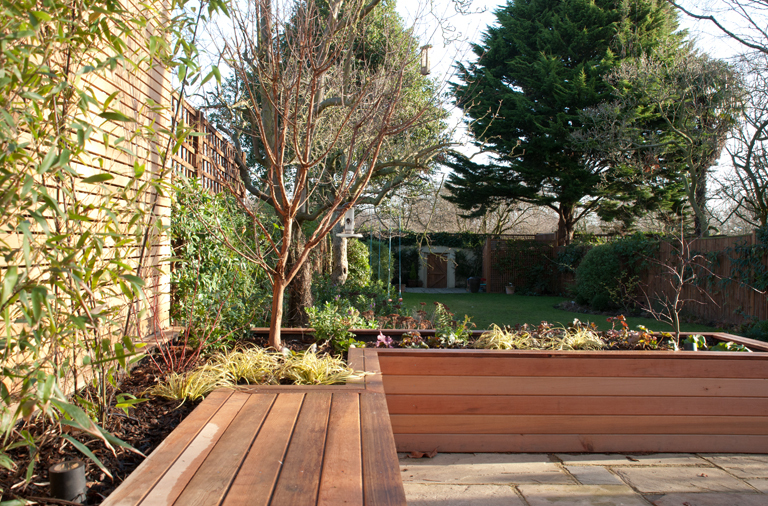 The planting, when it has had time to mature, will soften the straight edges and connect the terrace to the rest of the garden. The steps have been made wider with the same dimensions for each, and we have introduced a landing at the bottom. When steps meet a lawn, it is always better to install paving at the bottom otherwise the grass tends to get worn. The planting beds at the bottom of the planters soften the look and also connect the two areas to eachother. 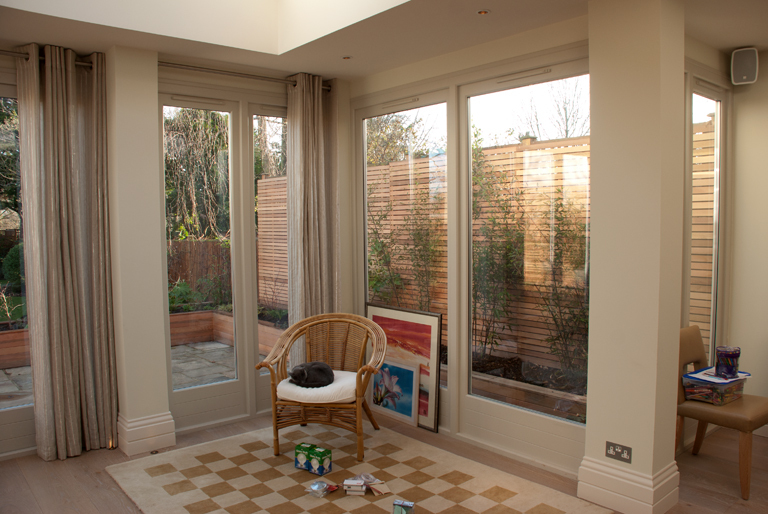 As you can see, the ugly walls have been screened with cedar contemporary trellis which also helps to make the terrace area a space in its own right. In an ideal world the paving would have been changed to something a little more contemproary, but I think the York stone works quite well as a link between the formality of the terrace to the more informal garden beyond it. 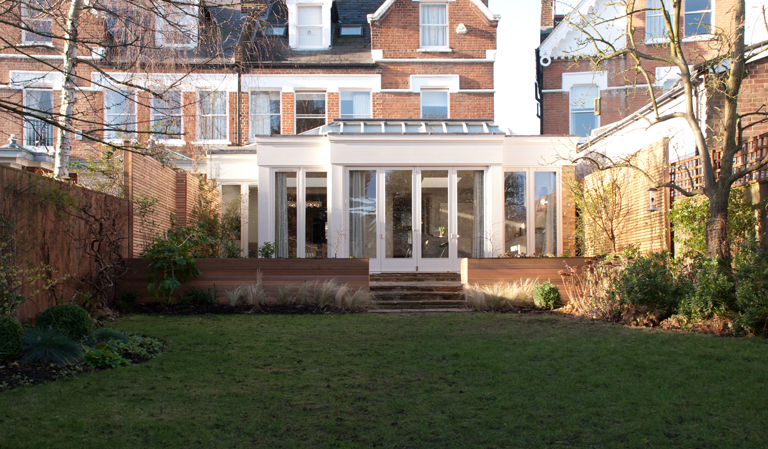 Sometimes I am asked to work with clients to help them to improve what they have already and I think this project is a great example of how you can elevate a basic terrace to something really quite special. I also wanted to show you how the garden looks from inside the house – they’re not show stopping pictures I’m afraid, but I think they’ll give you a good idea of how the garden ties in with the house now. 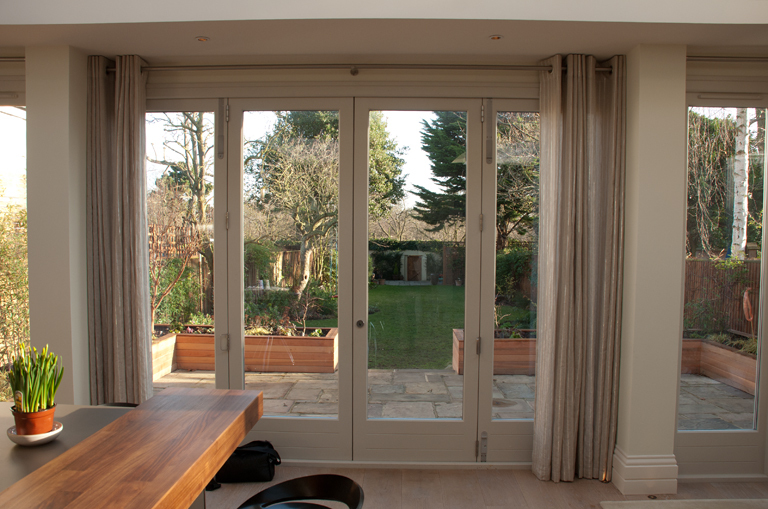 Because the back of the house is now predominantly glass, it was important to make the garden feel connected with the inside space. There is also a basic lighting scheme outside which highlights the main structural plants and maintains the link at night. The area on the right as you look out of the house was dead space before and planning restrictions prevented the extension from meeting the boundary wall. 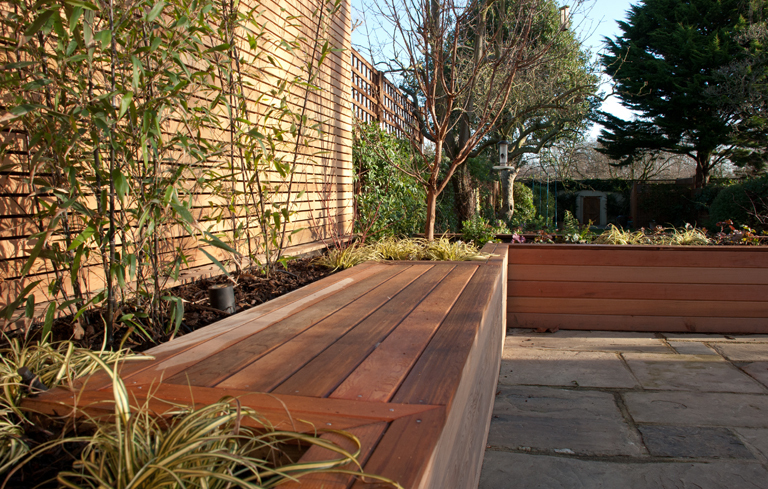 My clients really wanted to see some greenery in this space so we extended the raised planter and planted some black-stemmed bamboo (physllostachys nigra) which will provide interest all year round. The only thing left to do now is to source the lounge-style furniture but this will happen in the Spring – we didn’t think there much point in buying the furniture now when my clients won’t be sitting out there. I’ll be popping back in a couple of months to check on the planting and to ensure that the irrigation has been turned on so I’ll look forward to sharing the pictures after the furniture has arrived. Like this design very much it looks so comfortable to live with and does not scream “brand new” at one. Thanks Janine. Sometimes it’s difficult to marry old with new but using natural materials, especially timber, can really help. WOW! This looks stunning LIsa. Wonderful to see the finished article! Thanks Fiona – really glad you think so!